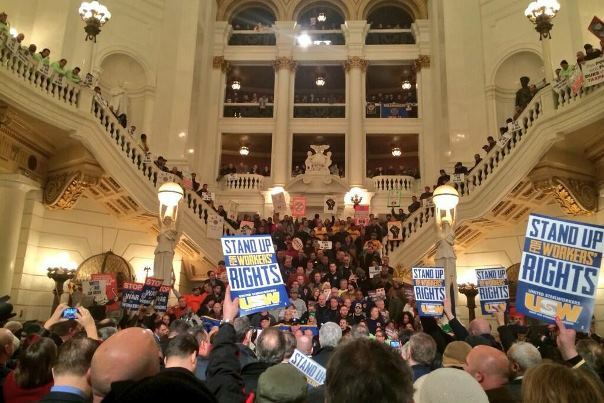 Nearly 600 IAM public-sector members, other union members, supporters and Democratic lawmakers in Pennsylvania are preparing for a full-on strike against new legislation to defund unions representing state, school district and municipal employees. Hundreds packed the Pennsylvania Capitol Tuesday for a huge rally against two identical bills in the state House and Senate. The bills – the latest anti-union cookie-cutter draft legislation written, provided and sponsored by billionaire brothers Charles and David Koch – seek to prohibit government employers from automatically deducting union funds from union members’ paychecks. The same Koch brothers tactics were used by Republican Gov. Scott Walker to upend public employee unions in Wisconsin in 2011 and Republican Gov. John Kasich’s attempt to weaken unions in Ohio. Police and firefighter unions are exempt. Republican Pennsylvania Gov. Tom Corbett, as part of a calculated attempt to weaken labor unions’ ability to garner campaign monies to unseat him in the upcoming 2014 election, says he would sign the bill if passed by the GOP-controlled legislature. Both chambers of the Pennsylvania legislature have yet to schedule a vote on the issue. Residents of the Keystone State who support working families and oppose this legislation should take action and email Gov. Corbett and their state legislators by clicking here.